Merfolk is a blue-based tempo (or aggro-control) deck based around the synergies of the Merfolk creature type. While Merfolk tribal synergies have been part of Magic since Alpha thanks to Lord of Atlantis, the idea of a deck predominantly comprised of Merfolk wasn’t a reality until Lorwyn and Shadowmoor blocks, when many of the deck’s support elements were printed. The deck’s true beginnings as a cross-format powerhouse started when Master of the Pearl Trident was printed in Magic 2013. Merfolk’s basic strategy is to overload on so-called “lords,” creatures that provide +1/+1 bonuses to other creatures of the specified type. This creates a powerful army whose performance is greater than the sum of its parts. The deck supplements this aggro plan with an accelerant in Aether Vial, as well as some catch-all disruption effects, some of which are on the creatures themselves. Merfolk is mostly fair, linear, and highly proactive. It features high levels of redundancy in its lineup, which makes for a highly consistent gameplan. This combines with the mono-colored manabase to make the deck a smoothly running powerhouse capable of taking down most any deck in Modern. This is most notably reflected in its finishes—Merfolk has been Tier 2 or Tier 1 for the entirety of Modern Nexus’s time tracking the deck, taking down two Grand Prix and numerous other tournaments during that timeframe. Merfolk is one of the few tempo decks in Modern’s highest competitive echelon, standing alongside Death & Taxes and Grixis Delver. It is also the most aggressive of the three, to the point where turn-four goldfish kills are possible (some people would even argue for its classification as an aggro deck). Its general philosophy is to try and assemble a board of synergistic creatures and use them to impose a quick clock on opponents. Because of the additional tempo that an active Aether Vial can net you, some Merfolk hands can roar out of the gates and quickly overwhelm opponents. You can also use this Vial to play more of an aggro-control game, either spending your mana on disruptive effects while using the Vial to deploy your forces, or applying disruptive creature effects at instant speed. However, the deck is plenty capable of operating without Aether Vial, and can in fact choose to do so in attrition-oriented matchups where tempo is less critical than sheer threat density. As implied above, synergy is the lifeblood of the deck. The lynchpin are the lords that provide pump effects and evasion, but that alone doesn’t make a deck good (as the absence of other tribal decks based on those effects clearly illustrates). However, it does enable otherwise unimpressive disruptive creatures (Cursecatcher, Harbinger of the Tides, Tidebinder Mage) and utility creatures (Silvergill Adept, Merrow Reejerey) to close out a game efficiently once you have seized the advantage. Islandwalk provides extra utility to an otherwise one-dimensional card like Spreading Seas. Master of Waves can break a board stall, help you recover from a sweeper, or take a slower board state and make it threatening in a hurry. Overall, each piece builds on the others in order to keep the train running. As Merfolk is a tempo deck, it is often tasked with assuming different roles depending on what opponent it is facing. Against fast linear decks like Affinity, Burn, Death’s Shadow, and Infect, Merfolk will look to play defense with counterspells and disruptive creatures, then swiftly turn the corner. Against decks that want the game to go long like Jeskai, Jund, and Gx Tron, Merfolk is the aggressor. It may cast the occasional disruption spell, but it’s all geared toward buying time to finish the game. Against decks that are looking to buy time to set up a combo finish, such as Ad Nauseam and RG Valakut, you have to strike a balance between both approaches. Disruption is important, but so is a steady clock. One of Merfolk’s major strengths is this ability to act as a credible aggro deck against slow decks, while presenting enough interaction to contain fast decks. On the other hand, Merfolk is more aggressive than it is interactive—one of its weaknesses are decks that get going too quickly for the disruption suite to make an impact. Another weakness is blue’s sparse permanent removal options. Most Merfolk decks are mono-blue; it’s the variant with the most consistent manabase, and the blue/colorless toolbox is deep enough to address most issues Merfolk could run into. However, some players do attempt splashing a second color in order to have access to a broader toolbox, with white being by far the most common thanks to Wanderwine Hub. White gives Merfolk access to an unconditional removal spell in Path to Exile and some nice sideboard cards. The most notable of these are Rest in Peace for top-shelf graveyard hate and Stony Silence against Affinity and Tron. However, these two-color variants have posted less consistent results than their mono-colored analogs. Splashes tend to water down one of Merfolk’s major strengths: its consistency. The off-color cards also have roughly equivalent options in blue or colorless (including Phyrexian-mana spells like Dismember and Gut Shot), so the upgrades tend to be marginal. Therefore, the stock and most successful Merfolk lists are almost invariably mono-blue. Lord of Atlantis and Master of the Pearl Trident are the reason Merfolk exists as a deck. Not only do they reward you for restricting yourself to the Merfolk creature type by giving the other creatures +1/+1, but they also provide mass evasion in the form of islandwalk. This combines with the deck’s ways to impose Islands upon your opponent to ensure mass unblockability, one of the deck’s major calling cards. Aether Vial is Merfolk’s tempo anchor. It gives you the ability to spit out creatures faster than you could otherwise cast them, and adds an additional angle of interaction by flashing in creatures as a combat trick or in response to the opponent’s spells. Vial can be a bit of a dead topdeck (which is why it tends to come out against decks with an attrition gameplan), but in general it’s one of your most important cards. For more on the particulars of playing with Aether Vial, check out the Tips and Tricks section below. While Cursecatcher seems a bit unassuming at first, it’s a hugely important tempo piece against combo decks looking to go over the top and attrition-based decks that try to kill your more dangerous lords. Furthermore, it can serve as early pressure until it’s called upon to counter a spell. This flexibility and disruptive prowess sets Cursecatcher apart from other one-drop options, and in turn sets Merfolk apart from other aggro decks by giving it game against a wide variety of spell-based opponents. It should come as no surprise that a primarily mono-blue deck will employ lots of basic Islands. The density of basic lands in this deck helps shrug off effects such as Blood Moon, Fulminator Mage, Tectonic Edge, and other sources of land hate, and gives you a very consistent manabase. Master of Waves is the deck’s curve-topping haymaker. It shrugs off a lot of common removal spells, including Abrupt Decay and anything red, and its enters-the-battlefield effect can take stagnant board states and flip them on their head. It’s particularly potent against decks like Burn or Jund, where it can effectively end the game on the spot. It tends to be sided out against faster decks like Affinity and Infect, but it’s still a very strong contributor to the deck. Merrow Reejerey is the deck’s third lord, and while its effect isn’t as offensively potent as the two-mana lords, it’s a very versatile one. Its cast ability can be used as ramp by untapping your own lands or Aether Vials, or it can be used as evasion by tapping your opponent’s creatures. It can even be used defensively by untapping your creatures after attacking. Lastly, its mana cost is a bit more forgiving on the blue side than the other lords, which can come in handy if you draw lots of Mutavaults. A very flexible and useful card that novice Merfolk players often underrate. Mutavault is a useful little land that gives us another body to project all our tribal buffs onto (including that of Master of Waves). Its benefits include being cheap to activate and relatively hard to kill (it dodges sorcery-speed removal and anything with a “nonland” clause). Colorlessness can be relevant too, as some anti-Merfolk measures are targeted to the mono-color creature base. Another note is that you can sandbag its activation during the combat phase to try and dodge effects such as Cryptic Command. The fact that it doesn’t produce blue mana can sometimes be a bit problematic, but it’s a problem that Merfolk is well-equipped to deal with thanks to Aether Vial. An absolute must-have. Often considered the best card in the deck, Silvergill Adept provides a two-power body alongside a critical cantrip. The reveal drawback is often irrelevant given Merfolk’s typical density of creatures, and is further mitigated by the presence of Aether Vial. One of Merfolk’s most powerful tricks, Spreading Seas fulfills multiple roles in the deck. It gives Merfolk’s creatures mass evasion when Lord of Atlantis or Master of the Pearl Trident is on the table, disrupts the opponent’s mana base, and keeps your hand full by replacing itself. Seas can be used to try and cut an opponent off a given color, or to disable utility lands ranging from Boseiju, Who Shelters All, to Inkmoth Nexus, to Raging Ravine. It often gets sided out against blue-based decks, but it’s potent enough against the field that it merits mainboard spots. In this section, we’ll be talking about the card choices you can use to fill out the rest of your Merfolk deck. We’ll also be indicating whether the cards being discussed are generally thought of to be in the mainboard, the sideboard, or both. Chalice of the Void is a very potent tool to bring in against opponents who rely heavily on zero-drops (Affinity, Living End) or one-drops (Bogles, Burn, Death’s Shadow, Elves, Infect, RG Tron). It can be a bit awkward on the draw, or as a topdeck, but its early-game shutdown potential makes it worth running. I think it’s a sideboard card in Modern (unlike in Legacy) because it can be dead against grindy decks and of questionable value against control, but it’s a very good one. One thing to note is that it will influence construction of the rest of your deck, because you don’t want the rest of your interaction to conflict with it. Sideboard. Grafdigger’s Cage is a handy little artifact that puts a damper on everything from conventional graveyard reanimation decks, to Snapcaster Mage triggers, to cards like Chord of Calling and Collected Company. Not truly applicable enough to be featured in the mainboard, it’s a potent sideboard bullet that can make some matchups less troublesome, including Abzan Company, Dredge, Elves, Griselbrand, Jeskai Nahiri, and Kiki Chord. Sideboard. The most common piece of graveyard hate in Merfolk decks because of its cheap cost and cantrip ability, Relic of Progenitus can whittle away at your opponent’s graveyard to keep cards like Snapcaster Mage or Tarmogoyf under control. 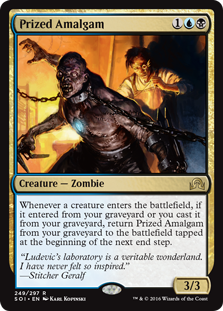 It can also clean out an entire graveyard in response to a big Dredge turn or a Griselbrand reanimation attempt. Highly recommended as a sideboard piece, and in some metagames it’s even mainboard-playable. Mainboard or Sideboard. This unassuming little 2-drop fulfills several useful functions in Merfolk; it can enable some of your weaker attackers to get damage in by crewing it, it can act as a colorless flying blocker to battle an opponent’s evasive creatures (most notably Etched Champion and various flyers out of Affinity), and it can loot away extra lands and/or Aether Vials to find you more useful cards. All in all, Smuggler’s Copter has proven worthy of consideration in Merfolk. Mainboard. Harbinger of the Tides is one of the more recent printings that have made Merfolk a consistent top-tier contender. The bounce effect attached to a body of the appropriate creature type can be a huge tempo swing (especially when Vialed in), and its flash option makes it even more flexible. Additionally, it has amazing synergy with Merrow Reejerey, as you can use Reejerey’s trigger when casting a Harbinger to tap your opponent’s creature, then use Harbinger’s enters-the-battlefield effect to bounce it. I would argue that this creature is very close to being part of our core, and thus should be in most Merfolk mainboard configurations. Mainboard. One of the nicer tricks in the Merfolk toolbox, Kira, Great Glass-Spinner helps keep your creatures safe against targeted removal in addition to providing an emergency flying attacker/blocker. Not being a Merfolk and costing three mana makes it a bit clunky, but that’s something you can work around. Good in either the main or the side. Mainboard or Sideboard. A creature with a defensive effect that’s on-tribe, Kopala, Warden of Waves can often ensure that your board state state continues to grow out of control, while benefiting from all of the pump effects that make Merfolk dangerous. While its effect does not counter spells outright and does not apply to triggered abilities, it has great synergy with other “tax” effects (such as that of Cursecatcher) and wards off spells like Abrupt Decay. A welcome addition to the Merfolk toolbox. Mainboard. Phantasmal Image is a very flexible card. You can copy your own creatures to double up on the best effect for the matchup, or coopt a hard-to-answer threat from the opponent. However, it is very fragile, as it can die to something as innocuous as a pump spell or a tap effect. Moreover, most of Merfolk’s creature protection tools (counterspells, Kira, Great Glass-Spinner, Spellskite) can’t save it. It’s also worth noting that it’s not a Merfolk while in your hand or being cast, so it interacts poorly with Cavern of Souls, Merrow Reejerey, Silvergill Adept, and Wanderwine Hub. It can be very powerful, but it has to be used judiciously. Mainboard. An interesting card in Merfolk, Spellskite can be used both offensively as a disruption piece against decks that rely on targeted effects (Bogles, Burn, Death’s Shadow, and Infect), or defensively to soak up removal and other nasty effects. It obviously doesn’t put any pressure on your opponent, which is why I’d suggest looking at it as a noncreature spell in terms of determining your threat lineup. It’s at its best as a sideboard bullet, where it can be brought in for matchups where it completely turns the game around. Sideboard. Thassa, God of the Sea’s scry effect can be a great way to pull ahead in grindy games, and getting to devotion five lends you an indestructible beatstick. However, it’s a bit slow at three mana, and its unblockability effect is not something that moves the needle all that much in a deck that’s already pretty evasive. I consider it to be a quality sideboard card that comes in during matchups where you expect to be topdecking, or where an indestructible 5/5 could swing a game. An important thing to note is that indestructible does not save this creature from dying to cards like Dismember or Path to Exile when active, so be wary of siding it in against decks that play those cards. Sideboard. Tidebinder Mage is another of the disruptive creatures Merfolk has access to, and it’s a very good one. Tapping your opponent’s creature down indefinitely is often as good as removing it (and sometimes even better), and you get a body of the relevant creature type in the process. There’s some debate as to whether to run it in the mainboard or sideboard, depending on what other cards you’re making room for and what you’re expecting to face, but most Merfolk players will have this in their 75. Mainboard or Sideboard. While not a Merfolk and a bit awkward in terms of mana cost requirements, Vendilion Clique can fill an important support role in a Merfolk deck by providing the deck with a way to strip sweepers or combo payoff cards before they’ve even been cast. It also provides a solid flying body to boot. Another interesting perk is that it can be flashed in independently of Aether Vial, which frees you up to play at instant speed. It’s a relatively new addition to the Merfolk arsenal, but I’m of the opinion it’s worthy of discussion. Mainboard or Sideboard. Sea’s Claim can combine with Spreading Seas to basically shut your opponent out of colored mana if they’re not running blue (Merfolk decks that employ this card are often known as 6-Seas, 7-Seas, or 8-Seas, depending on how many copies they opt for). While it’s not terribly useful against blue-based decks (though you’re favored against those anyway), it can be devastating against any deck that relies on a three-color manabase or otherwise depends heavily on their lands (BGx, Death’s Shadow, Eldrazi, Tron, and Zoo). In some metagames, Sea’s Claim can even be considered as a mainboard card. However, it has mostly settled into a role as a member of the sideboard that comes in to smash opponents soft to land hate. Mainboard or Sideboard. While a bit off the beaten path, Threads of Disloyalty nonetheless offers a powerful effect. Taking control of the likes of an Insectile Aberration or a Tarmogoyf can really turn a game around, and if an opponent has no enchantment hate, they might be forced to remove their own creature, adding insult to injury. Its range is narrow enough that I wouldn’t play it in the mainboard, but it’s a potent sideboard effect. Sideboard. Dismember is the best removal spell Merfolk decks have access to. It can be quite painful from the life perspective, but hard removal against most relevant creatures in Modern is usually worth it. Merfolk players have used this in both the mainboard and the sideboard. Mainboard or Sideboard. Dispel is narrow, but it’s a cheap and effective way to deal with a lot of spells that spell trouble: Collected Company, Cryptic Command, Goryo’s Vengeance, Lightning Bolt, Kolaghan’s Command, Path to Exile, and Searing Blaze, among others. It’s almost strictly a sideboard card, but it’s good at that role. Sideboard. Echoing Truth is nice catchall bounce effect. Its ability to bounce multiple copies of the same permanent can be significant against creature tokens and decks that like multiples of the same effect on the board (the mirror match being one of the most notable). This is one of Merfolk’s few answers to something like a resolved Ensnaring Bridge or Worship. It’s usually featured in the sideboard, but mainboarding it is not unheard of. Mainboard or Sideboard. Gut Shot is a sneaky-good card in Merfolk. While dealing 1 damage doesn’t seem all that great, it can provide you with a potent early tempo advantage by zapping small creatures (especially mana dorks) while costing no mana. It also can be a way to zap threats from fast decks (like Signal Pest, Steel Overseer, or Vault Skirge from Affinity, or any Infect creature) to try and gain the tempo edge. A very strong sideboard option. Sideboard. Hibernation is a powerful hate card found in some Merfolk sideboards. It can come up huge against the likes of Bogles, Elves, or Zoo, decisively granting you the tempo advantage. However, it’s a bit up there in terms of mana cost, so it can sometimes be a bit awkward to cast. Sideboard. A one-sided mass bounce effect for artifacts, Hurkyl’s Recall is mainly a consideration in order to patch the otherwise-awful Affinity matchup. It can also put in good work against the likes of more fringe decks such as Lantern Control, 8-Rack, and any other deck that features Ensnaring Bridge. This is one of the more controversial sideboard inclusions in the Merfolk community—some players prefer to skip out on it and try to dodge Affinity, whereas others argue that Affinity is very hard to avoid in highly competitive events and thus it’s a must-have. I think both approaches are valid, and the choice to include them or not boils down to how much of it you expect to see. Sideboard. Negate is an effective and versatile counterspell. It’s especially effective against big-mana decks like Tron, which can simply pay the extra cost imposed by cards such as Spell Pierce. It’s a bit too expensive for most Merfolk decks to carry in the maindeck, but it’s a strong sideboard card. Sideboard. While Remand doesn’t get rid of anything permanently, the tempo boost you get from sending it back up to their hand often makes it worth your while, especially given that it replaces itself. It fits in well with Merfolk’s primary gameplan, and can play an important role either off the main or the side. Mainboard or Sideboard. Spell Pierce is one of the most common cards in Merfolk decks. Its primary benefits are covering a broad variety of spells and being cheap and easy to sneak into a curve. Its weakness—that it fades in utility as the game goes on—is also addressed nicely by the fact that Merfolk can impose a quick clock on opponents. It’s not the most individually potent card, but its flexibility and affordability make it a major asset. Mainboard or Sideboard. The drawback might scare some people away, but Swan Song is a pretty good catchall counterspell to bring in from the sideboard against the likes of combo and control decks. A 2/2 flier can’t outrace a Merfolk deck on its own (especially when Harbinger of the Tides can wink it out of existence), and shutting down key spells will give your rush the chance to finish the game. Sideboard. As a creature-based tempo deck, Merfolk will often have more boots on the ground than its opponent, and that makes Unified Will a powerful counterspell to bring in out of your sideboard. It’s particularly useful against decks that seek to beat you with powerful spells they’ve ramped into, or against sweepers looking to clear your board. Sideboard. Bouncing a creature is a nice tempo play, and the fact that Vapor Snag tacks on life loss makes it even nicer. You can even use it to save your own creatures in case of an emergency. I think it’s an integral piece of our catch-all disruption package, and would feature it in the mainboard. Mainboard. Cavern of Souls makes your Merfolk uncounterable, which is a nice perk to have against control and tempo decks. However, it has a notable downside in that it can’t be used to produce blue mana for off-type creatures or spells, which can sometimes complicate the business of casting creatures while leaving mana up for interaction. Because of this (and the fact that Aether Vial already helps you dodge counterspells) it’s not a true staple, though it’s generally pretty easy to sneak a couple into a manabase. Mainboard. The free basic land that Ghost Quarter provides your opponent can make its effect seem like much ado about nothing, but not all lands are created equal. Some decks pack very few basic lands and will run out of them quickly (Affinity, Infect, and Tron being the major examples). Others rely heavily on specific lands for their game plan, either to ramp (Eldrazi, Elves, and Tron), or to attack (Abzan, Affinity, Grixis, Infect, Jund, the mirror). You can even use it on your own lands to fix your mana in the rare event you get color-screwed. Eminently playable. Mainboard or Sideboard. Minamo, School at Water’s Edge protects you from Boil and Choke by providing a non-Island blue source. For the same reason, it also provides free points in the mirror match where mass islandwalk is a regular factor. You can also use it for some fun interactions involving Kira, Great Glass-Spinner (assuming the shield has been lowered by some other effect) or Thassa, God of the Sea. You also only need the one. Mainboard. One of the most useful land choices, Oboro, Palace in the Clouds has a narrow but strong interaction with colorless lands on the rare occasions you find yourself short on blue. You can tap Oboro to produce blue mana, tap any other land for the generic mana needed to bounce Oboro, then replay Oboro and tap for blue mana again, effectively using it as a mana filter. Add in the fact that it protects you from Boil and Choke and again grants free points in the mirror, and it should come as no surprise that it’s a highly recommended option. Mainboard. Tectonic Edge is one of Merfolk players’ preferred pieces of land hate. It hits a wide variety of targets, including shocklands, creature lands, Urza Tron lands, Valakut, the Molten Pinnacle, and more. It’s uncounterable, cheap to use, and destroys lands at card parity. Furthermore, you can use it to produce mana until its effect becomes relevant. Bringing this card in from your sideboard can really ruin some opponents’ days. Sideboard. Wanderwine Hub is yet another non-Island blue source that keeps you safe from the likes of Boil or Choke and turns off islandwalk in the mirror. For this reason you’ll often see it appear even in lists with no white splash. The drawback is basically negligible in a deck with this many Merfolk creatures, so there’s not much reason to skip out on it. Mainboard. This section will contain information on how to combat all of the current Tier 1 and Tier 2 archetypes, as well as other archetypes of note. This matchup is challenging for one reason only: if the Abzan Company opponent successfully executes one of its combos to gain infinite life, Merfolk loses on the spot. The combo featuring Murderous Redcap in place of Kitchen Finks poses the same problem. The fact that you have to try and kill them through their blockers and lifegain while respecting the fact that they can combo off means that your resources will be stretched in two different directions. That said, if you find a fast aggro hand, or if your opponent isn’t threatening to assemble the combo early, this matchup is very beatable. As this might imply, your priority is to find Aether Vial, lords, and Spreading Seas (mostly as an evasion tool, but also to turn off Gavony Township). Any disruption pieces to keep your opponents from assembling the combo or using their early acceleration come in as a rather distant second. Strike quickly, hold up disruption if you have it, and you might be able to pull off the upset. Because a significant part of the Abzan Company strategy revolves around fetching combo pieces or silver bullets via Chord of Calling and Collected Company, anything that can stop those spells from resolving is good. Grafdigger’s Cage is a powerful hate piece against this deck, as it shuts off both of those cards. As icing on the cake it turns off all their combos, with the exception of the Archangel of Thune kill. Dispel is another strong answer to Chord and Company. Negate and Remand can be adequate, but not quite as efficient as Dispel. Dismember kills any combo piece without persist, Gut Shot pops either mana creatures or Viscera Seer, and Tidebinder Mage can slow the opponent down by tapping down a blocker or a mana-producing creature. In terms of what to take out, pure tempo effects such as Harbinger of the Tides and Vapor Snag are not the greatest. They give a deck crawling with enters-the-battlefield effects another chance to use them. Master of Waves is also of questionable utility, as it’s on the slow side. Abzan Company’s extensive ramp package also makes “tax”-style counterspells like Spell Pierce rather weak. Facing Ad Nauseam is mostly a race—your safest bet is to to kill them before they try to combo off. In order to do so, you’re looking for two things: lords to deal damage faster, and disruption effects to prevent the opponent from setting up their combo or delaying your aggro rush. This is one of the matchups in which Cursecatcher shines, as forcing your opponent to spend one more mana to resolve Ad Nauseam can sometimes buy you another turn. Aether Vial is also huge here, as you need to get on track as fast as possible. Because Ad Nauseam needs to reach at least five mana to cast its namesake spell, you are strongly incentivized to build your board early, then hold up countermagic once your opponent is putting together ramp effects or Phyrexian Unlife. This is a matchup where speed and efficiency pay off. Given Ad Nauseam’s lack of removal, a card such as Master of Waves would be great if it resolved. But waiting until turn four or five is not a luxury you can often afford, so out it goes. Vapor Snag is also useless, because Ad Nauseam doesn’t play creatures. Harbinger of the Tides is essentially a 2/2 of the relevant creature type against this deck, but you may end up keeping it in because of a lack of palatable options to replace it. Spreading Seas may seem rather useless at first glance, but it helps cycle through your deck and very elegantly answers Boseiju, Who Shelters All, which could otherwise be a problem. Here you want to bring in as much countermagic as you can carry. Dispel, Negate, Remand, Swan Song, or Unified Will can all catch the Ad Nauseam coming in, with all but Dispel also doing double duty against Phyrexian Unlife. You can also catch the Unlife with something like an Echoing Truth. Remanding something like a Lotus Bloom can also be brutal. An amusing little interaction with Ad Nauseam is Kira, Great Glass-Spinner and Lightning Storm. If you discard a land card to make the Lightning Storm target Kira, her ability will counter the Lightning Storm, and your Ad Nauseam opponent will be unable to do anything about it. If you have her, side her in. Let’s not mince words—this is our worst matchup in all of Modern. Thanks to mana accelerators like Mox Opal and Springleaf Drum, they often empty their hand too quickly for Merfolk to respond appropriately. Moreover, they feature a deep suite of evasive attackers which can be very painful when paired with pump effects like Arcbound Ravager or Cranial Plating. Bounce and removal like Dismember, Harbinger of the Tides, and Vapor Snag are critical here in order to make up lost ground, and Spreading Seas can help keep cards like Blinkmoth Nexus and Inkmoth Nexus at bay. You’ll need a combination of interaction, aggression, and a slow start from the opponent to win, but it’s certainly possible, especially postboard. There’s some debate in the Merfolk community about how to combat this matchup. Some prefer to dedicate sideboard space to try to shore it up, while others simply try to dodge it in pairings. I firmly believe that the matchup is too common for the latter option, especially in large events. If Affinity were to somehow lose its perennial Tier 1 standing in the Modern metagame. Because of Affinity’s prevalence, I recommend that most Merfolk players invest some of their sideboard slots in Hurkyl’s Recall. As Simon Slutsky proved in Grand Prix Los Angeles earlier this year, you do have a chance to beat them as long as you carry those. Cards like Echoing Truth and Gut Shot can also be pretty handy. When you’re on the play, a Chalice of the Void on zero can also put a serious damper on their early development. That said, Chalice’s usefulness wanes dramatically if it’s not in your opening hand or if you’re on the draw, so it’s a bit of a gamble. Bant Eldrazi has a classic ramp strategy: play early accelerants and then slam down big creatures. However, unlike most ramp payoff creatures, Eldrazi feature a variety of useful effects. That said, our strategy lines up very well against theirs, as we’re spitting out similarly-sized creatures, only faster. Aether Vial is one of the big reasons why—it enables you to outpace your opponent in terms of creature deployment. Master of Waves is also very good, as it can help you hold off the likes of Thought-Knot Seer and Drowner of Hope or let you go so wide that the Eldrazi player can’t block all of your attackers. In addition to being faster than your opponent, you have some options to disrupt their development. You can target their Noble Hierarch (or an attacking creature) with Harbinger of the Tides, delaying their clock. Attacking their manabase while simultaneously granting yourself evasion is very effective, so Spreading Seas is a beating. You can even tap down their blockers with Merrow Reejerey if you don’t have islandwalk set up. Take all of these together, and it’s pretty easy to see why Merfolk is favored in this matchup. This is a matchup where there’s really not much to side out—most of our mainboard performs pretty well against Eldrazi, with the possible exception of Cursecatcher because of its small size and the lack of targets. Dispel definitely outperforms Spell Pierce against a ramp deck with Path to Exile, but no other counterspell does overly much thanks to Cavern of Souls. Ghost Quarter, Sea’s Claim, and Tectonic Edge are useful pieces of disruption against a deck that leans so heavily on its manabase to cast big creatures. Kira, Great Glass-Spinner and Spellskite are useful because they can ward off Drowner of Hope and Eldrazi Displacer activations, and as one- or two-ofs you can usually find room to sneak them in. Last but not least, Dismember can zap the most bothersome Eldrazi that you happen to be facing at the time, and Echoing Truth or Negate can help you beat tech cards like Engineered Explosives and Worship. The BGx matchup is one of the more controversial ones within the Merfolk community. Some players consider it relatively easy, albeit grindy, and others describe it as a struggle. Despite these differences in opinion, most large-scale data collected on this subject has Merfolk as a convincing favorite over either deck. I consider this matchup one of the trickier ones to master, but rather straightforward once you get a hold of it. The key to this matchup as Merfolk is to keep constant pressure on your opponent and stay ahead on tempo. As long as you’re the one deploying threats and your opponent is the one answering them, you’re going to be in a good place. Spreading Seas is also a potent tool to cut them off colors and get around their often-large blockers. Its ability to draw you a card (along with Silvergill Adept) also help out tremendously here. I wouldn’t mulligan unless absolutely necessary, as the goal of a BGx deck is to run you out of resources. Every card you voluntarily send away is one less they have to get rid of. Master of Waves tends to be a huge play in this matchup—Jund can’t easily remove it, and Abzan’s smaller removal suite usually means it will produce lots of tokens for you. As long as you can deal with haymakers like Liliana of the Veil, Kalitas, Traitor of Ghet, and Siege Rhino, this is a matchup you should be confident in. Playing against BGx is peculiar in that one of our signature cards (Aether Vial) isn’t actually that good against them. It’s a terrible topdeck in a matchup where topdecks matter, and as a card that depends on having other cards in hand, it’s vulnerable to effects such as targeted discard. Lastly, relying on it heavily to fix an otherwise non-ideal mana situation can backfire, given that they feature several spells that can destroy it. Therefore, one of the most important sideboarding decisions a Merfolk player can make against BGx is to take the Aether Vials out. Tempo cards such as Spell Pierce and Vapor Snag also tend not to be at their best in this matchup. A Merfolk player has various options regarding what to sideboard in. Relic of Progenitus nullifies threats such as Grim Flayer, Scavenging Ooze, and Tarmogoyf, as can Dismember and Tidebinder Mage. Sea’s Claim and Tectonic Edge are usually brought in to supplement the land hate plan, which BGx is rather vulnerable to. Kira, Great Glass-Spinner can also be very helpful, provided it doesn’t run into something like an Abrupt Decay. If you favor Thassa, God of the Sea, this is one of her best matchups, as both the scry ability and the 5/5 body are handy. Lastly, hard counters can occasionally be useful against BGx. Dispel tends to be better against Jund and its broader array of instant-speed removal, whereas Negate is a bit stronger against Abzan. While Merfolk may not finish games against Burn at the most comfortable life totals, this is actually one of the deck’s better matchups. Because of Burn’s heavy reliance on colored mana, a Spreading Seas often feels like a cantripping Stone Rain. Furthermore, the deck struggles mightily to answer a resolved Master of Waves, and Aether Vial helps you dodge one of their major sources of recurring damage in Eidolon of the Great Revel. Furthermore, they can’t really do much against your creatures if you ever cobble together enough lords to get out of Bolt range. One of the keys to the Burn matchup is a commitment to playing defense—if your opponent puts you in a situation that grants you an opportunity to trade cards for life, you should usually take the trade. Some examples of this are sacrificing your Cursecatchers any time you get a chance to counter a burn spell, always blocking Goblin Guides or Wild Nacatls with your Silvergill Adepts, and blocking Monastery Swiftspears even when you expect a combat trick. These decisions will keep your life total healthy enough to prevent the opponent from closing you out before you can turn the corner. When it comes to what cards to board out against Burn, the key thing to remember is that you’re looking to streamline your curve and eliminate risky cards. Master of Waves is obviously untouchable here, but cards like Merrow Reejerey and Kira, Great Glass-Spinner aren’t strictly necessary. Dismember is obviously awful, and should be taken out immediately if it’s in your mainboard. Remand and Spell Pierce can sometimes be handy, but they can also feel awkward when an opponent is topdecking Bolts with plenty of mana open. As far as cards to bring in, Tidebinder Mage is an absolute beating, as it can erase an attacker while providing one of your own, or deal with troublesome creatures like Grim Lavamancer. Dispel is also a handy way to protect your life total and your creatures, especially against Searing Blaze. Chalice of the Void on one shuts off a plurality of their spells, but note that it doesn’t catch haymakers like Atarka’s Command, Boros Charm, or Searing Blaze. Spellskite is fantastic at protecting your creatures, especially if you can spare the mana to pay for its activation cost the conventional way. Echoing Truth is also handy here. Lastly, bringing in Sea’s Claim and committing to shutting them out of colors can also be a powerful strategy, provided that you don’t neglect to interact with threats that are already on the board. How Merfolk fares in this matchup depends on how the deck’s flex slots were utilized. You need as many tools as possible to blunt this deck’s initial rush, so Harbinger of the Tides, Tidebinder Mage, and Vapor Snag will help you do better than builds without access to those cards. Zoo employs temporary pump effects and lots of cheap, efficient creatures that lack evasion to try to deal a lot of damage quickly. Your job is to buy time until you can turn the game around by making your creatures bigger than your opponent’s, or land a Master of Waves to turn the board state around. You won’t always have ideal blocks, but it’s important that you preserve your life total such that you don’t get finished by something like a Lightning Bolt or an Atarka’s Command. You usually can’t do much about hands featuring more than one Burning-Tree Emissary followed by a Reckless Bushwhacker while you’re on the draw, but you have a pretty good chance of corralling them otherwise. As when facing other fast linear decks, Merfolk seeks to streamline its curve against Zoo. Slower cards like Kira, Great Glass-Spinner and Merrow Reejerey tend to come out, as do conditional counterspells like Spell Pierce. Dismember is also very bad against a deck this aggressive. In their place, I advise bringing in hard counters like Dispel, tempo hosers like Tidebinder Mage, and a capable blocker that can absorb targeted effects in Spellskite. Hibernation is a high-variance card here—while it is expensive and won’t catch creatures like Goblin Guide or Reckless Bushwhacker, landing one at the right time can essentially force your opponent to start over. While this deck features several variants, all of them are white-based Aether Vial decks based around “tax” effects on creatures such as Leonin Arbiter and Thalia, Guardian of Thraben, alongside enters-the-battlefield effects such as Flickerwisp. Fortunately for Merfolk, most of the “tax” effects don’t affect us much, and our creatures are usually larger than theirs. Landing a Spreading Seas can also keep us away from the combat tricks and land hate the deck is fond of employing. Of the three most-played variants of the deck (mono-white Death & Taxes, GW Death & Taxes, and white-black Eldrazi & Taxes), the latter is the most challenging. Their creatures are the largest among the variants, and their combination of hand disruption and removal lines up better against us than the abilities featured by the creatures in other variants. However, your strategy against all three decks is similar—get off to a hot start with Aether Vial and lords, and use your superior offensive firepower to overwhelm them before their synergies get going. Given how well your mainboard typically functions here, it should come as no surprise that you’re not really looking to make drastic changes. The only creatures that somewhat underachieve are Cursecatcher (due to lack of targets) and Vapor Snag (because of all the enters-the-battlefield effects). Dismember is usually a slam-dunk inclusion, as it eliminates any threat you may find particularly irksome. Echoing Truth can give you an out against bothersome permanents such as Ghostly Prison and Worship, as well as clear out token swarms. Kira, Great Glass-Spinner or Spellskite help protect your creatures against Eldrazi Displacer or Wasteland Strangler when facing Eldrazi & Taxes, whereas Tidebinder Mage helps shut down creatures favored by green-white D&T. The current version of this deck is a grindy aggro-midrange hybrid that seeks to disrupt its opponents with discard and removal, then either fill its graveyard for Tarmogoyf and Traverse the Ulvenwald, or chip at its own life total for the namesake Death’s Shadow. The arsenal is rounded out by a couple of trample-granting effects to slip damage through blockers. The key here is to weather their initial disruption storm, and then try to disrupt them in turn. Their manabase is greedy and has no use for blue, so Seas effects are devastating. Your Lords can also allow your creatures to waltz by their blockers. Your Mutavaults will tend to play a big role here. The key to this matchup is to ensure a steady stream of gas—because of that, Aether Vial is not at its best here, and should be cut from the maindeck. Top-end spells like Master of Waves can also be somewhat awkward against a deck that gets its gameplan going relatively quickly. I recommend bringing in more Seas effects if they are available, as turning their lands blue is a punishing blow. Anything that can protect your creatures from removal, disrupt your opponent’s creatures, or attack their graveyard is also pretty useful here. A relative newcomer to the higher echelons of the Modern competitive scene, Dredge can be a challenge to any deck if it gets off to one of its trademark fast starts. Fortunately for Merfolk, Dredge’s fast starts require red mana and resolving spells, which are elements of the game the deck is well suited to disrupting. As long as you can interact with them early, you can keep the board from going too wide, which is usually where you would be in trouble. In general, a Spreading Seas to keep them off Conflagrate or a counterspell to keep the looting train from leaving the station will go a long way toward winning these games. Of course, that’s not always possible, so Merfolk has to have a plan B for when Dredge does get the engine churning, but hasn’t quite got enough juice to end the game on the spot. Master of Waves is huge in terms of buying you time with a squad of blockers. Bounce effects such as Harbinger of the Tides and Vapor Snag obviously slow the Dredge deck down, as does an early Cursecatcher or Spell Pierce. Keep them off balance for as long as you can, then transition to finishing the job before the deck recovers. When facing Dredge, there are no shortage of hate cards for the matchup, which means that your postboard games will arguably be easier than the preboard ones. Trim slow-developing cards like Kira, Great Glass-Spinner and Merrow Reejerey and mundane kill spells like Dismember for counterspells like Negate or Remand, graveyard hate in Grafdigger’s Cage and Relic of Progenitus, and even land hate in Sea’s Claim. As long as you can land these interaction spells within the first few turns, you are giving yourself a very good chance to win. One of Merfolk’s more difficult matchups, Elves present a challenge because they can cast lots of creatures in a short period of time, and Ezuri, Renegade Leader is something we have difficulty answering. Our best bet here is to try to be as aggressive as possible, and pressure their life total enough to force them to block, or enable a lethal alpha strike with Spreading Seas. However, this is an uphill battle because of the speed provided by creatures such as Elvish Archdruid, Heritage Druid plus Nettle Sentinel, and the reach of Shaman of the Pack. During the course of the game, if your deck provides you with opportunities to productively use your disruption, do so. Do your best to counter spells like Chord of Calling, Collected Company, or Lead the Stampede, as those are big trouble if they resolve. Also consider bouncing mana-producing Elves (especially Elvish Archdruid if you get the chance) with a Harbinger of the Tides or a Vapor Snag as a way to gain positive tempo. One of the key pieces Merfolk needs to compete against Elves are shutdown pieces. The most accessible ones are Tidebinder Mage (for individual creatures), Hibernation (for a board state), and Grafdigger’s Cage (for their creature-fetching tools). Chalice of the Void gets interfered with by Cavern of Souls, but on x=1 it will shut down their ability to use Elves to cast other Elves. Dismember is for key creatures such as Elvish Archdruid and Ezuri, and Dispel helps fight off Chord of Calling and Collected Company. This deck boasts an impressive removal suite, as well as the ability to pressure opponents’ life totals via efficient threats such as Delver of Secrets and Tasigur, the Golden Fang. But it’s also vulnerable to Merfolk’s assaults on its life total thanks to its painful manabase, which enables our islandwalk as insult to injury. Their threats are vulnerable to tempo plays such as those provided by Harbinger of the Tides and Vapor Snag, their counterspells are invalidated by Aether Vial and Cavern of Souls, and Master of Waves poses a huge problem by dodging most of their removal and making a host of creatures that have to be dealt with. Merfolk’s role is typically that of the aggressor, forcing your opponent to find answers quickly or succumb to the evasive forces at the door. When sideboarding against Delver, consider islandwalk a given due to their urgent need for blue mana. Thus, you can safely take out Spreading Seas, as they have plenty of use for mana of their color and you won’t need it for evasion purposes. In its place, I suggest hard counterspells such as Dispel or Negate, though Unified is also quite good. Additionally, consider making room for graveyard hate cards like Relic of Progenitus in order to make this deck’s delve threats harder to cast and shut off utility creatures like Snapcaster Mage. Kira, Great Glass-Spinner is fantastic here, as Delver has no spells that get through her shield and will always have to spend a minimum of two kill spells to get rid of her (which in turn sets them up from blowouts by way of your countermagic). This matchup boils down to whether you have a fast clock and land disruption or not—if you do, you will more than likely win, as Tron is very soft to creature rushes before all three Urza lands are on the battlefield. If you don’t, things get a lot more difficult. While the likes of Karn Liberated and Wurmcoil Engine aren’t terribly effective against Merfolk, Oblivion Stone can get rid of anything you cast that’s not a Mutavault, and a resolved Ugin, the Spirit Dragon or Ulamog, the Ceaseless Hunger tends to be a game over. As such, you’re looking for two things out of your hands—fast aggression (preferably in the form of lords) and a Spreading Seas. Fortunately for Merfolk, fast aggression is something it is eminently capable of, and you are more than capable of punishing any stumbles on the part of the Tron player. This isn’t the most comfortable matchup in the metagame (as you’re always operating under a clock), but it’s one that you will win more than you lose. As much as I like Master of Waves, his four-mana cost is a bit of a liability here. By turn four, you should be threatening to end the game on the ensuing combat phase in order to feel comfortable against Tron. Dismember and Vapor Snag are also not at their best here, as there are few creatures and most of the ones that are played are pretty resilient to these types of effects. Harbinger of the Tides has a similar limitation, but he’s needed as a body that can be pumped. I highly recommend bringing in more land hate against Tron—Spreading Seas are great, but you may not always draw them. Ghost Quarter, Sea’s Claim, and Tectonic Edge all come in handy here. Additionally, counterspells such as Negate, Remand, and Unified Will will buy you some time to finish the game. Bounce effects like Echoing Truth and Hurkyl’s Recall are a bit riskier (as they’re reacting to threats already on the table), but they can also buy you a bit of time or open the way for your attackers to finish the Tron player off. Lastly, most current variants of Tron are running a fair amount of instants postboard, so Dispel can find a home against them as well. This is a matchup that depends upon the deck composition favored by the Merfolk player—configurations with mainboard creature interaction (Dismember, Harbinger of the Tides, Vapor Snag) and countermagic (Remand, Spell Pierce) tend to do well, whereas those that choose to play without these tools will struggle. Regardless of your deck composition, this is a matchup in which Merfolk has to play defense—Infect is faster, has evasive attackers, and is capable of ending a game in a flurry of pump spells. Prioritize hands with Aether Vial and disruption in them. Infect tends to do quite a bit of damage to itself and is rather poor at the business of defending the pilot, so you usually only need a handful of creatures to finish them off. Tap out as sparingly as possible, and attempt to interact with creatures on your turn whenever you can in order not to get blown out by Apostle’s Blessing, Blossoming Defense, or Vines of Vastwood. Overall, this is a matchup that rewards patience on the part of the Merfolk player—pick your spots and don’t take unnecessary risks, and this matchup is eminently winnable. The most important thing you can do against Infect is streamline—they put a lot of pressure on Merfolk to interact with them, and to do it quickly. As such, top-of-the-curve options like Kira, Great Glass-Spinner, Master of Waves, and Merrow Reejerey are a bit too clunky here. If you can be casting nothing but one- and two-drops against Infect postboard, you’ll be in a pretty good place. As for what Merfolk brings in against Infect, I recommend as much interaction as possible. A Chalice of the Void on one is probably the best possible thing to bring in, even if it sometimes conflicts with your other pieces of cheap interaction. Barring that, counterspells like Dispel, Negate, Remand, Spell Pierce, Swan Song, and Unified Will can all protect you from their pump effects or make sure your creature interaction sticks. Speaking of creature interaction, if you have any Dismember, Echoing Truth, or Tidebinder Mage in your sideboard, this is a great time to side them in. Infect players are often prepared to face cards like Spellskite, but siding it in is still justified, as it demands an answer. Beating fair decks that have relatively slow win conditions is one of the things that Merfolk does best, especially when they have few creatures to fight back with and are relying on counterspells to slow their opponents down. Jeskai Nahiri’s combo win condition has to be respected, but the fact that it can be delayed or eliminated by attacking it with creatures means Merfolk is pretty well suited to handling it. Furthermore, a timely Harbinger of the Tides or Phantasmal Image can interrupt their plans in a nasty way. Merfolk’s task in this matchup is to keep up the pressure without exposing itself to blowout. Play around sweepers like Anger of the Gods, Engineered Explosives, and Supreme Verdict (preferably using Aether Vial), and keep a steady stream of threats on the battlefield. The key is to keep three to four threats on the table at all times, and Vial in or cast more only as necessary. In general, you should expect that most of the creatures you cast throughout the game will die—Jeskai Nahiri has a deep suite of spot removal. One possible exception is Master of Waves, which conveniently dodges most of their removal and brings at least one other creature with him upon entering the battlefield. Because of this, he’s often the card you’re happiest to see in this matchup, even if your devotion will usually not be anything to write home about. Another card you’re very happy to see is Silvergill Adept, as it is a threat that replaces itself. Given that your opponent already has Islands, Spreading Seas is not at its best here (despite the presence of Celestial Colonnade), and can be safely sided out. Vapor Snag also doesn’t do much against a deck with a creature count this low—it does help you defend your creatures, but counterspells do that better. Merfolk has access to some very potent sideboard tools against Jeskai Nahiri. Grafdigger’s Cage turns a good portion of the deck off, as both Nahiri, the Harbinger and Snapcaster Mage are stymied by its effect. Relic of Progenitus only catches the Snapcaster, but it also draws a card, which is a big deal in a control matchup. Counterspells like Dispel, Negate, Remand, Swan Song, and Unified Will are also handy. Ghost Quarter and Tectonic Edge can help you contain Colonnade if the game gets to that point, and Thassa, God of the Sea can help make sure that your draws stay relevant in the mid-to-late game. Kiki Chord typically features lots of mana-producing creatures and dedicated blockers, to gum up the ground and either fetch or ramp into one of its combo win conditions (Kiki-Jiki, Mirror-Breaker plus Restoration Angel or Nahiri, the Harbinger). Its combos are relatively easy for Merfolk to disrupt, and its value-based midrange backup plan is rather slow and ineffective compared to a lord-fueled offense. Thus, as long as you can keep them from comboing off, you have a very good chance to win. Given that Kiki Chord spends its first few turns setting up, you will have free rein to develop your own board, then hold up disruption in the midgame as you finish the job. Their manabase is somewhat greedy, so a well-placed Spreading Seas can punish them effectively in addition to enabling your creatures to slip past their blockers. Featuring disruptive spells like Dismember, Harbinger of the Tides, Tidebinder Mage, and Vapor Snag also makes this matchup easier. Being able to counter Chord of Calling is often one of the key moves Merfolk can make in the Kiki Chord matchup. Unfortunately, Spell Pierce sometimes has trouble doing so in the face of the multiplicity of creatures Kiki Chord employs (especially Wall of Roots, which can provide mana and then tap for convoke), so it tends to be sided out. Master of Waves is also on the slow side for a deck against whom Merfolk must be aggressive. As mentioned above, Dismember and Tidebinder Mage excel against Kiki Chord. Harder counterspells for Chord like Dispel, Negate, Remand, and Swan Song are also quite useful, especially if they can also catch Nahiri, the Harbinger. Grafdigger’s Cage is a massive play here, as it shuts off both Chord and Nahiri, whereas Relic of Progenitus denies one of their signature plays in the Eternal Witness value chain. While a bit tricky for more novice Merfolk players, Living End is actually one of our better matchups. The key is patience—playing through Aether Vial to keep the namesake spell from blowing you out is very important, as is holding up countermagic to try and catch the Living End coming in (just watch out for Ricochet Trap!). Keep three or four threats on the table at all times, and pressure your opponent into having to cast the cascade spell on your terms, not theirs. When they do, your interaction will be waiting for them. Cursecatcher is an incredible source of positive tempo in this matchup, as it can pressure and disrupt at the same time. Spreading Seas can mess with their mana (they are very dependent on red, and have almost no use for blue), and is important for ensuring evasion in the event that the counterspells and pressure don’t finish the game off in time. If the Living End player does manage to go off, don’t panic—you will likely have some creatures of your own returning to play. Remember to sacrifice all of your Cursecatchers in response to the Living End, even if it won’t counter the spell, as you’ll get those back right away. The next order of business is to Vial in and/or cast the next wave of Merfolk. Master of Waves is at its best here, as it can give you a plethora of blockers to hold Living End’s attackers back. As long as you play patiently and have disruption, you have the advantage. Because a Living End player will only want to go off once they have a swarm of creatures in their graveyard, single-target removal and bounce effects such as Dismember and Vapor Snag are not at their best here. Harbinger of the Tides is in the same boat. Lastly, Merrow Reejerey really promotes building up a big board state, which is risky business against a deck whose entire goal is to wipe your board. Those cards should be benched against Living End. In their place, pack as many counterspells as you can muster. Dispel, Negate, Remand, Swan Song, and Unified Will are all useful, and a Chalice of the Void on zero will force the Living End player to remove it or be unable to cast their most important spell. Unlike most graveyard-based decks, Living End is not stymied by Grafdigger’s Cage, so Relic of Progenitus is your graveyard hate piece of choice here. While I did say that single-target effects are not at their best here, Tidebinder Mage‘s ability to tap down a potential attacker and also keep it from blocking makes it useful enough on a post-Living End board state that you might want to side it in. The Merfolk mirror is obviously a race, and a rather uninteractive one—because both players are capable of granting their creatures islandwalk, not much blocking occurs in the combat phase. Both players are basically looking to build up a big force as quickly as possible, and then attack for lethal. Opting for nonbasic sources of blue mana such as Cavern of Souls, Minamo, School at Water’s Edge, Oboro, Palace in the Clouds, and Wanderwine Hub puts you at an advantage here, as you have better odds at putting together a functional manabase that doesn’t make your opponent’s creatures unblockable. Speaking of which, Lord of Atlantis is a double-edge sword in the mirror—it grants all Merfolk islandwalk and +1/+1, not just yours. As such, I recommend holding it back and only deploying it when absolutely necessary. Lastly, Harbinger of the Tides and Vapor Snag are a house in this matchup, as they can lead to some major blowouts in combat. The first thing I’ll say is that you should not cut your Lord of Atlantis here. They’re risky, but you still need the full complement of islandwalk-granting effects and pump. Spreading Seas also might not seem like the greatest, but they can shut down Mutavaults and grant you islandwalk on the rare occasions it’s not present. You don’t need all four, but you do need some. Lastly, counterspells (especially our counterspells) are terrible against Merfolk. Take them out. In their place, you want any and all creatures and creature interaction you happen to have in your sideboard. Dismember and Gut Shot can ping creatures, Kira, Great Glass-Spinner and Spellskite can protect them, and Thassa, God of the Sea and Tidebinder Mage provide extra bodies. If you must bring in a counterspell, I recommend Dispel, as it can stop creature interaction spells. This deck’s furious ramping pace and fast combo finishes (regardless of whether it’s a Scapeshift or a Through the Breach) make it a rather challenging matchup for Merfolk, especially because there aren’t many ways to efficiently interact with lands. Fortunately for Merfolk, you have one of them in Spreading Seas, which affects their ability to kill you with Valakut, the Molten Pinnacle and either ramp spells or natural land drops. Unfortunately, it can sometimes be a dead card against the combo finishes when they bring lots of lands onto the battlefield at once. Another thing that makes the matchup challenging is the presence of mainboard Bolts and sweepers to slow down your rush. Some flex slots help make this easier, but this is a matchup in which Merfolk’s sideboard is going to come up big in order to win. As alluded to above, sideboarding against these decks is crucial. While Master of Waves is typically very good against red decks and their removal suites, that’s not the case here—sweepers may spare the Master, but they kill his tokens, and Valakut activations are actually colorless by virtue of coming from a land. This means he’s not at his best here. Creature removal like Dismember and Vapor Snag does little in the face of an Emrakul, the Aeons Torn or a Primeval Titan. In their place, you want countermagic—Dispel can catch removal spells or a Through the Breach, whereas Negate, Remand, Swan Song, and Unified Will can answer pretty much anything. Land hate pieces such as Ghost Quarter, Sea’s Claim, and Tectonic Edge can also be helpful. Because these decks rely on Primeval Titan as a finisher, Tidebinder Mage can play a big role, especially if it gets Vialed in. It also helps clear the way against some of the blockers that these decks sometimes play, such as Courser of Kruphix and Obstinate Baloth. Merfolk is quite clearly the aggressor in this matchup, as Scapeshift’s combo win condition takes multiple turns to assemble and the deck is packed with interaction to buy time until this occurs. If you can assemble a strong rush and dodge or counter sweepers (or a Bring to Light looking to fetch sweepers), you should be in great shape. However, beware the likes of Cryptic Command tapping down your creatures to buy them more time, and their ramp effects making your “tax”-style counterspells weaker. If the game gets to the point where Scapeshift is being cast, be prepared for a fight—chances are they have several counterspells in reserve to protect their combo. Your best bet is to finish the game before that happens. One of Merfolk’s key advantages here is that its manabase is painless, which requires a Scapeshift player to go off with eight lands in play (as opposed to the seven they would need if you were at 18 or less life), which means you usually have a bit more time than most. While “tax” counterspells like Spell Pierce and Cursecatcher aren’t the greatest against Scapeshift, you can’t cut them. You need to interact with them in the midgame as much as you can. Slow cards like Master of Waves, on the other hand, are very cuttable. Despite Spreading Seas being a land hate piece, it’s not very good here, as blue mana is something that Scapeshift has plenty of use for and it doesn’t impede their combo much unless it catches a Valakut, the Molten Pinnacle. Removal spells like Dismember are Vapor Snag are almost completely useless. I strongly recommend both counterspells and land hate. Ghost Quarter and Tectonic Edge can either target Valakut to make comboing off more difficult, or even a Mountain to blank Valakut activations altogether. On the counterspell front, Dispel helps ward off removal and win counterspell wars, whereas Negate, Swan Song, and Unified Will are primarily to counter their win condition, Bring to Light, or any sweepers the Scapeshift player may run. If your opponent has open mana, Vial your creatures in during their end step. The key here is to try and chokepoint their ability to respond to your forces. This is often more important than squeezing out every last drop of extra damage a given Lord is capable of granting you. This method will also protect your creatures from sweepers. Aether Vial’s charge counter effect is optional. Because Merfolk is a deck centered around two-drops, Vial is generally best served by ticking up to two counters and staying there. In fact, the most helpful Aether Vial setting when in topdeck mode is two charge counters, because it makes Silvergill Adept a live draw. Think long and hard before you set any option other than two. Adding a charge counter to Aether Vial is a triggered ability, and can thus be responded to. Doing so is a convenient way to tick Vial up to four for Master of Waves while still developing your board with two-drops. As an example, if you have an Aether Vial on two counters with a Silvergill Adept and a Master of Waves in hand, you can respond to the charge counter trigger on your Vial by activating, putting your Silvergill into play, then letting the ability resolve and adding the third counter to your Vial. This will allow you to Vial in Master of Waves on the following turn. When faced with the option of opening with a lord or a Silvergill Adept on turn two against an uncertain opponent, I recommend opening with the Adept. However, if your opponent uses damage-based sweepers such as Pyroclasm or Anger of the Gods, the correct play may be to open with the lord, in order to get out of range as soon as possible. Remember that Merrow Reejerey’s cast trigger can tap or untap any permanent. Its most common uses are to tap down blockers or untap lands so you can cast more Merfolk, but artifacts, enchantments, and your own creatures are all fair game. That means that you can Vial in a creature, cast another, then use the trigger to untap the Aether Vial. Also note that its ability will be countered by Kira, Great Glass-Spinner if it targets one of your creatures while the ability is up, and that it will kill a Phantasmal Image if you target it. If you are expecting sweepers, resist the temptation to deploy the entirety of your forces and race. Instead, put your opponent on a three- or four-turn clock, hold up any disruption you may have, and repopulate the board once the sweeper resolves. Aether Vial and Mutavault are your best tools for this task, but don’t forget that Harbinger can be cast with flash if you have enough mana. When using this approach, it’s okay to cast a Master of Waves with little to no devotion in order to keep the pressure up. That said, it probably should be the last creature you cast. If you’re looking to play around a Cryptic Command with a Mutavault, tell your opponent that you are passing priority to the declare attackers step. At that point, your opponent may respond by casting their Cryptic Command. If they do, you allow it to resolve, activate your Mutavault, then attack with it. If not, they will no longer have an opportunity to tap anything with Cryptic and you can attack unhindered. Note that if you get too greedy and try to animate the Mutavault during beginning of combat or something, they will still be able to respond to that trigger and thus blank your whole attack. Be careful with your exact word usage to make sure there’s no confusion. When playing against Merfolk, there are two general approaches to victory. One is to threaten them with rapid development of your own, forcing them to interact with you quickly or lose. This is generally the most effective approach, and decks capable of doing it comprise all of Merfolk’s worst matchups. A second approach is to pick off the key threats, such as lords, as Merfolk creatures have relatively unimpressive power and toughness values without them. Killing a lone Master of Waves also results in the death of any of its Elemental tokens. This approach is considerably more difficult, as Merfolk has a large number of threats and can generally find more creatures to replace the dead ones. In order for this strategy to work, it has to include sweepers and other ways to trade one of your cards for two (or more) of theirs, or be backed up by pressure on the Merfolk player’s life total. Destroying an Aether Vial or a Spreading Seas can also delay Merfolk nicely. As far as hate cards go, the most generally applicable options are an Engineered Explosives set on two (most creatures in the Merfolk deck are two-drops, as is Spreading Seas) or a sweeper like Anger of the Gods or Supreme Verdict. Volcanic Fallout is decent because it’s uncounterable, but Merfolk gets out of range rather easily. Rending Volley can be very good, but narrow, and it can’t catch a Master of Waves. Choke and Boil are potent strikes on the manabase, but Merfolk players often prepare for them with nonbasic sources of blue mana (and the effectiveness of any attack on their lands is diminished by the presence of Aether Vial). Overall, the most important thing when facing Merfolk is the proactive advancement of a gameplan. Being durdly or reactive gives the Merfolk player an opportunity to set up their deck’s internal synergies, which can often overwhelm most interaction.